Two dogs dumped at a California shelter have touched the hearts of dog lovers when it was revealed that they couldn’t live without each other. Chiquillin (aka ‘Chicky’) is a 6-year old Chow and Goofy is a Terrier, also 6. The two were separated from one another when they were dropped off at Carson Animal Care Center by their former owner. But when they stopped eating and would do nothing but cry in their separate kennels, it quickly became obvious to the shelter workers that the two were missing each other terribly. The moment the two dogs were reunited they quickly calmed down and gave each other comfort. 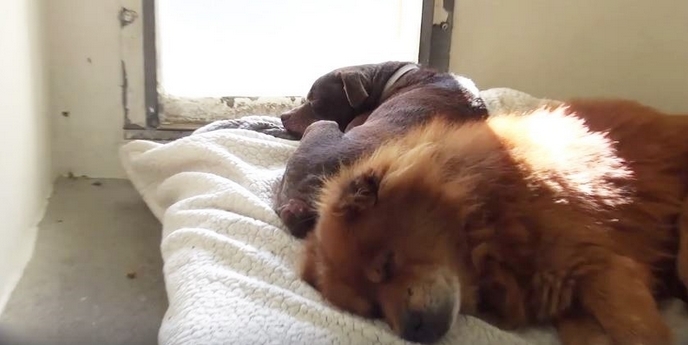 As soon as dog rescuer Katy DePasquale saw the two cuddling together, she knew she had to do something to help the bonded pair. However, there was a problem. Chicky was on a “rescue-only” list because he snapped at a vet who was trying to help treat his eye infection. But that did not deter Katy. She contacted Christine Downs at Bark Party and explained what was going on and Chicky and Goofy were pulled from the shelter together. Now the two longtime buddies will be fostered by Bark Party together until they find the perfect forever home. Responses to "Two Dogs Refused To Eat In Shelter Until They Were Reunited"
I pray they find a loving home that will take them together.